1. 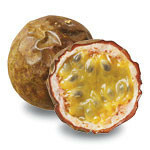 Combine Passion Fruit Concentrate and vanilla syrup in a glass. Add Diet Coke and stir. Pour into an ice-filled glass. Serve.